Material calculation and effective use of materials are critical factors in the economic success of your products. 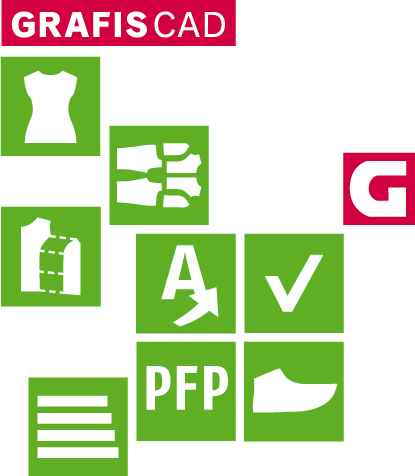 The stand-alone layplanning programme included in GRAFIS CAD assists you in this. It offers you an uncomplicated transition from pattern construction to laying out your pattern pieces for cutting. The layplan also helps you enormously in the pre-calculation of your material planning. Obviously, you have the possibility to use pieces from different styles when generating the layplan to ensure even greater material savings. The layplanning programme offers a multitude of adjustment possibilities for material, pieces and sizes. Apart from the usual functions for butting pieces together including settings for rotation, flip and buffers, GRAFIS offers you functions for special requirements. These include repeat points for laying out on patterned material, use of template layplans, automatic generation of fusing blocks, consideration of material flaws and shrinkage. Special layplanning options such as folded lays or tubular material are equally supported. To accommodate unusual projects, scans or photos of material and leather skins can be displayed as a background image, facilitating the choice of positioning on your materials. Make full use of the possibilities of digital print! With the new GRAFIS Layplan you now have the ability to print graphics or colour fields straight onto your pattern pieces. GRAFIS Layplan also enables you to position logos specifically and print them along with your pattern.